Salt River Project – Artworks PHX – a business-arts campaign in Phoenix, Arizona USA. SRP partnership transforms functioning hydraulic plant into public art space. Salt River Project (SRP) has been serving central Arizona’s power and water needs since 1903 with a vision of helping the Valley grow into a vibrant and sustainable metropolitan area. SRP is the oldest multipurpose federal reclamation project in the United States. As Greater Phoenix metropolitan area’s largest supplier of water and as well as community-based, not-for-profit public power utility, SRP has a long history of supporting Arizona-focused arts programing, along with many other programs and services that make our community a better place to live and work. SRP’s contribution to the arts includes monetary and in-kind support for many organizations, including Arizona Opera Company, Ballet Arizona, Black Theatre Troop, Chandler Center for the Arts, Heard Museum, Phoenix Theatre, and the Scottsdale Cultural Council, among others. SRP employees also are avid arts supporters, serving as board members and volunteers, as well as regularly attending performances. 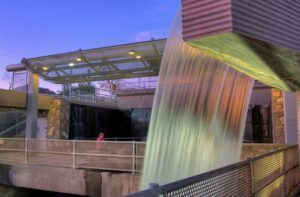 SRP’s commitment to creative place making while emphasizing the company’s distinct heritage is embodied at by Waterworks at Arizona Falls, an award-winning public art project made possible through a partnership with Phoenix Office of Arts and Culture and the U.S. Bureau of Reclamation. Arizona Falls, formed by a natural 20-foot drop along the Arizona Canal between what is now 56th and 58th streets, reopened in June 2003 as a restored hydroelectric plant and neighborhood gathering place. Walkers, joggers and bicyclists can enjoy the waterfall and learn about water as a precious resource through art, poetry and sound. Designed by renowned artist Lejos Heder and Mags Harries, the Stoa Deck at Arizona Falls is made of concrete textured with the imprints of cattails and reeds, reflecting the river and water system of Arizona as well as the merging of natural with manmade. Etched into the deck are poetic phrases by Arizona Poet Laureate Alberto Rios. Visitors can experience a thrilling, artistic and powerful display illustrating the importance of water delivery in Greater Phoenix.